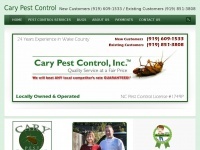 Cary Pest Control Is Your Cary North Carolina Exterminator Specialist. See Us Today and Ask for the Internet Special Discount! The web server used by Carypestcontrol.net is located near the city of Scottsdale, USA and is run by GoDaddy.com, LLC. There are many websites run by this web server. The operator uses this server for many hosting clients. In total there are at least 1,469 websites on this server. The language of these websites is mostly english.